Si quieres ver toda la información del viaje en Español, por favor haz click en este link. 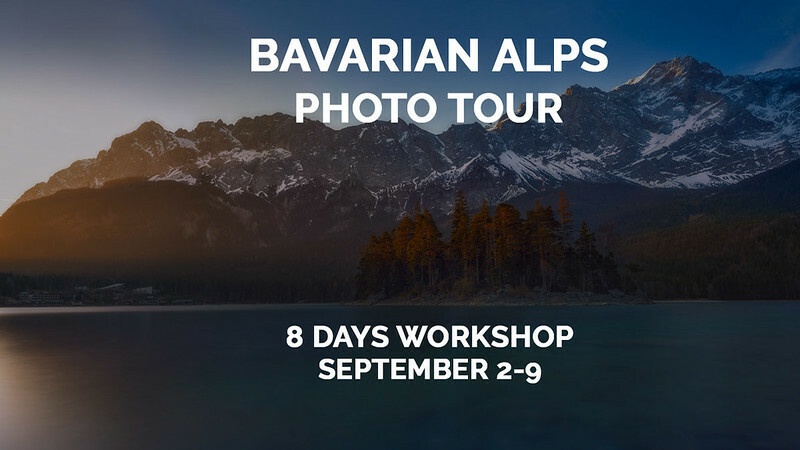 I have teamed up with the Travel Agency "NATURAL PHOTO TRAVEL" to create this amazing photo trip to the Bavarian Alps where me and my colleague Xabier Mendieta will participate as photography instructors. Located in the south of Germany, Bayern is the biggest and the most prosperous region of the country. Our journey will focus in the Alps area at the Austrian border. Accommodation based in 3-4 stars hotels with breakfast included every day. We will use 4by4 cars or similars adapted to the group necessities. It is a photography trip limited to a short number of people with 2 instructors that will help you ate every single moment. There is no need to have special physical conditions because of every location are easily reachable and just a few minutes walking from the parking places. The only location that is quite more difficult to reach is at KonigSee where we will have to walk around 40 minutes. Speaking about the places we will be stopping at along the way, it totally depends on the weather and rain conditions at the time. The summer will pass away already in this region but all the surrondings mountais will be green and beautiful. It is quite difficult to have snow in the peaks of the mountains at that time. - City of Munich and it's most impressive places. - Fussen and the Neuschwanstein Castle with the best photo locations. - The fabulous landscape of Berchtesgadener Land and it is villages. This is not a tipical journey where you do photos because you simply like it. Instead, we will drive you to the best locations at the very best moment so you will be able to learn amazing photography techniques getting incredible photos to add to your portfolio. We will be covering some of these topics in detail. - Photo instructions on specific locations. - How to optimize your camera. - Photographic techniques and best practices. - Working with light / photo theory. - Editing in Lightroom and Photoshop. - Building your digital library. - Social media tips and best practices for bussines. - Continuing Photography Education through out the journey. - 2 Photo instructors all the time. - 8 hotel nights with breakfast included. - SUV cars or similars adapted to the group. - Any way to arrive in Munich before the journey starts (airfare tickets, bus tickets...). - Any food outside the breakfast. No beverages included. - Access to boats, castles or any other kind of excursion. - Everything not shown in the "INCLUDED" section. 1165 Euros in double room (additional supplement will be charge if you want single room). 300 euros deposit is mandatory in order to book a spot.